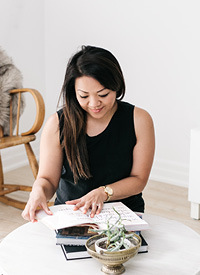 Vermilion — Love On Sunday Love On Sunday | Interior Styling in Toronto and the GTA. photo via Caan Design. By Jamie Bush & Co. Why, hello there. How is everyone? In light of the recent snowstorm we just experienced, I thought I would warm things up with a bit of colour inspiration. I'm officially in love with this interior above. Which is quite surprising since I've been all-rustic-everything lately. I love the juxtaposition of natural materials and industrial finishes in this photo. The b&w abstract painting against the wood console + paneling create such an interesting mix of textures and colour. And of course the gold adds a touch of bling to the photo which I can't be mad at. It's rather delicious, I think. And I'm calling this colour vermilion. I could be wrong, but apparently there are a hundred shades of vermilion. Some are more of a vibrant red and others more of a blood orange. Either way, I think it's lovely. I really need to add some colour into my home and wardrobe and this is a great hue to mix with tan, black or white. Feelin' it?